ExeMaster - ExeMaster - Symbian autorun manager. 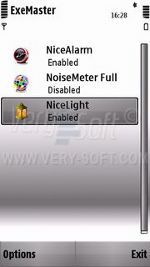 Exemaster is a symbian os s60 smartphone utility to add autorun function for all applications installed on the device. it brings most necessary functionality to adjust your phone's bootup. You can define applications to be run when you switch your phone on. Specify run type and add special parameters for each application you want to be automatically started, enable or disable certain app autorun. Main functionality : * specify application to autorun with operating system load; * specify type of autorun for each application; * Indicate parameters for program loading process; * On-the-fly localization switch; * Handy and useful management of the application list; * User friendly interface. Requirements: Symbian OS v9 s60, up to 600 кb of ROM to install and up to 300 kb of RAM to operate.